So, I’m ready for the big reveal of my favourite seafood chowder on PEI. Last Summer (2011), I went on the hunt for the best fish and chips on PEI and there was no shortage of good choices. This summer, I was hunting down a great seafood chowder that would become my 2012 favourite and, once again, there were lots to choose from. Thank goodness most restaurants had the option of ordering a “cup” of chowder as opposed to a “bowl” as my waistline would have severely shown the results of my summer 2012 food challenge! At the outset, I want to put forth some caveats and disclosures. First, I am not a professionally trained chef or food judge. My comments, impressions, and opinions are strictly my own; others may differ with the criteria I used to determine my favourite chowder and with my subsequent conclusions, or they may have different expectations that mine, and that’s perfectly fine. Second, I am not affiliated with, nor have any ownership in, any of the eating establishments where I sampled chowder; therefore, I have no bias for or against any particular restaurant’s chowder. 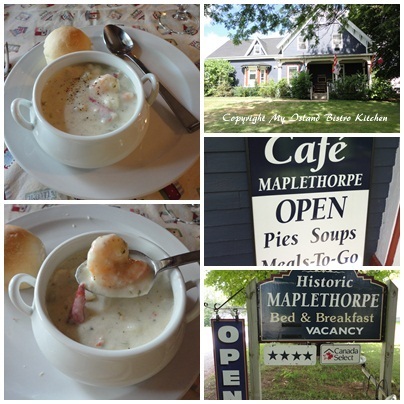 Third, I did not try the chowder at every single restaurant on PEI – there are dozens and dozens of restaurants on the Island and, while I like seafood chowder, seriously, there is a limit to how many I could reasonably sample! Fourth, I suspect most restaurants did not even know I was on a mission to find the best seafood chowder – I was simply a paying customer to them so there was no special treatment or effort made for my benefit – their chowders were as they were on the day I chose to sample them. At the end of the day, the chowder I chose was the one I personally liked the best and felt all-round met my criteria and expectations of a great seafood chowder. Everyone’s tastes are different and what suits one person’s taste buds may not appeal to someone else. Also, if tried on another day with a different chef in the kitchen, there is no guarantee the chowder would be the same as on the day I conducted my sampling. So, how did I choose the restaurants whose chowders I sampled? Well, some restaurants I already knew from personal experience were venues that served good food in general so I suspected their seafood chowder would likely be good, as well. I also invited, through Twitter, Facebook, my blog, and through word of mouth, people to put forth recommendations of restaurants they felt served good chowder. I also tried to make sure I sampled chowders from different locations all across the province. What was I looking for in a good chowder? Let’s start with the chowder base. First, it had to be cream-based, not brothy. Second, the consistency of the base was important. This is purely a personal preference to individual palette but, if it is too thick, I find it is like eating a casserole; if it is too thin, then it’s a broth, not a chowder as the word “chowder” signifies some degree of a thickened consistency. Finding just the right consistency is a challenge, no doubt about it. Third, I was looking for a chowder that did not taste “pasty” or “starchy” – signs of too much potato or flour content. Some chowders sampled simply had too much “heat” – i.e., way too much Tabasco or other hot pepper sauce and too many spices of one sort or another. To suit my taste, nothing should be added to the chowder that masks, downplays, or overrides the “star of the show” – the seafood itself. In my view, the chowder needs to be lightly and gently seasoned and flavoured to “enhance” the taste; however, there is a definite line between flavourful and spicy. A hallmark of a good chowder, in my opinion, is that it should have a smooth, gentle taste that does not “burn the whole way down” or leave a “bite” or distasteful aftertaste on the tongue. The second criterion was ingredient content – I wanted to see evidence of a variety of seafood. It sounds obvious but you’d be surprised how much “filler” some chowders can have. By that, I mean too much potato or too many other vegetables like celery or carrots and not much evidence of seafood or, alternatively, the only seafood you could detect would be some kind of white fish and no lobster, scallops, mussels, etc. The other thing I looked at was the size of each ingredient in the chowder. If an ingredient does not fit on a soup spoon then, in my opinion it does not belong in the chowder. One chowder I sampled had 3-inch junks of uncooked celery and ½-inch semi-raw carrot slices while another had potatoes, skins on, cut in [large] quarters. Another chowder, while otherwise tasty, had an ingredient I could not identify but it was a very large chunk (apx. 2” – 21/2”) of something that was very tough. In that instance, I asked the waitress to return it to the kitchen to have it identified. She returned saying the kitchen crew didn’t know but thought maybe it was a bar clam or quahog. Whatever it was, it did not belong in the chowder because of the size and because of the fact it could not be chewed. The fact that the kitchen staff couldn’t identify it raises a whole series of other questions! Just like the vegetables, the seafood ingredients need to be of a size that they fit on a soup spoon, too. That said, they do need to be sized so that they are not minced up and disguised yet not so large that you would really need to cut them with a knife to be able to eat them properly. In other words, I want to see a whole scallop or a piece of lobster large enough to know it’s lobster meat. Finally, the color of the ingredients – discoloured chunks of celery, carrot and other veggies are simply not appetizing and detract from the chowder – all ingredients need to be super-fresh. Regardless what we might say, our eyes do some of the ‘tasting’ too – in my view, a good chowder should be a white or slightly off-white, rich creamy color. If it is pink, orange, or some other color, that’s a sign it has been overdone with spice – while it may have seafood in it and be some kind of “stew”, in my books, it is not a traditional Canadian East Coast seafood chowder. I also considered the temperature at which the chowder was served. It should be ready-to-eat when it reaches the table – not blistering hot (suggestive it has been boiled) but neither luke-warm, bordering on cool. I did sample one that while I could tell it was tasty, it was barely luke-warm. While of less importance than the foregoing criteria, I did take note of the effort the restaurants put into presentation and what they served with the chowder. For example, those that garnished the chowder with a sprinkle of fresh parsley or paprika showed they cared enough about the product they were setting in front of the customer to dress it up a bit. Most served a biscuit or roll with the chowder and some presented the cup or bowl on a plate with a paper doily between the two – again, good effort on the extra attention to presentation. Price is always a ‘touchy’ and subjective issue. When I started out on this challenge, I placed no specific limitation on how much I would pay for a cup or bowl of chowder. However, my common sense soon came into play. I live in a province where there is an abundance of fresh seafood so there are no transportation or import costs and seafood is in season on PEI in the Summer. There were a couple of restaurants whose menus I looked at but their seafood chowder listed at $16. and above so I didn’t even try them because, well, as one friend says, the restaurant’s menu didn’t list any endangered species in the chowder that would rationale those prices! I found those prices a bit rich for my wallet so passed them by because, quite frankly, there were tons of other seafood chowders more reasonably priced to sample! The chowders I sampled ranged from $3.95/cup to $9.00/cup. The large bowl-sized servings were generally $2 – $5 more. I learned a more expensive chowder is no guarantee it is any better tasting than a more moderately priced one. 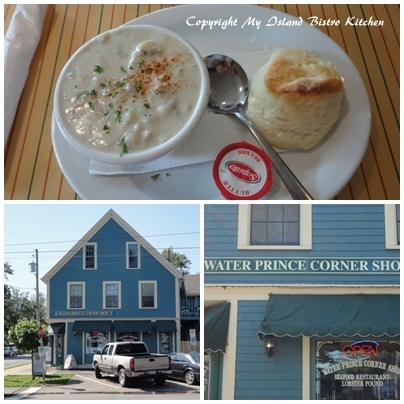 In fact, I often found that the lower priced chowders I tried were far more tasty than the higher priced ones (and, yes, they included all sorts of seafood like lobster, scallops, mussels, shrimp, salmon, and so forth, too). Finally, I made a real effort to try chowders in different parts of the Island. I sampled chowders from Souris in the Eastern part of the Island to North Cape, the most westerly tip of PEI. I tasted chowders from the North Shore to the South side of PEI because there are as many chowder recipes on the Island as there are cooks and chefs cooking them. In total, I tried nine (9) different chowders over the summer. There were five (5) that, really, they were neck and neck vying to be my favourite. While each did have a slightly different flavour (due mostly to the seasoning and flavouring added to the chowder base), any of the five (5) was just great, in my opinion. But, at the outset, I did say I’d pick my favourite – just one — so I am selecting the one from The Sheltered Harbour Restaurant in Souris, PEI. It happened to be the first one I sampled and it set the bar high from the get-go. The chowder at The Sheltered Harbour, priced at $5.99/cup, overall encapsulated what I was looking for in a great seafood chowder. The cream base was flavourful – very tasty and not spicy nor hot. They got the consistency of the cream base just right – it was neither pasty thick nor brothy thin. It had a rich creamy color. The chowder had good ingredient content – there was evidence of what I expect to see in a seafood chowder – a variety of seafood including scallops, salmon, shrimp, and white fish and it was not overdone with potatoes as a filler. All ingredients were identifiable and in proper bite-sized pieces. Close co-favourites were found at: Water and Prince Street Shop in Charlottetown ($6.95/cup), Brehaut’s in Murray Harbour ($3.95/cup), Maplethorpe Café in Lower Bedeque ($6.50/one size – this one had the best seafood ingredient content) , and Wind and Reef in North Cape ($8.50/one size – this one had, bar none, the best homemade rolls – incredibly light, airy, and flavourful!). Any one of these establishments, in my opinion, serves fine seafood chowder at reasonable and competitive prices. And, now, here is my ultimate test as to how good a chowder is: Would I return and order the chowder again? My answer to these five favourites is a hasty “yes, in a heartbeat and without reservation”. The one thing I did learn from this exercise is to ask questions about the chowders before ordering and not rely on how the menu describes them. For example, ask questions like: Is the chowder cream-based or brothy? Is the chowder base homemade or a mix? What kinds of fish are in the chowder? Is it spicy? If so, what are the spices/flavourings used? 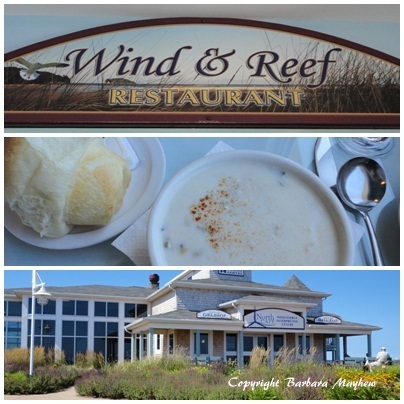 There are certainly more restaurants on the Island that I am sure serve great seafood chowders too but, as I mentioned earlier, I just couldn’t sample them all (hmmm, well, there is always next year!). So, my choice of my favourites for 2012 is based solely on my own taste test and expectations, one visit per restaurant. What I can say is that, on the particular days I tasted the chowders at these five restaurants, they were mighty darn tasty chowders! 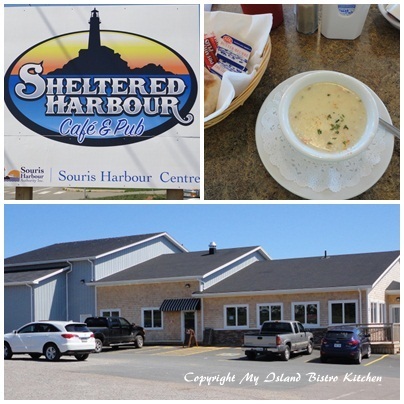 Thank you for dining at the Sheltered Harbour Cafe and for your favourable review on our seafood chowder. We appreciate hearing from the people who enable us to do what we love to do! The seafood chowder is made in-house by Chef Ed Steele using his closely guarded recipe. 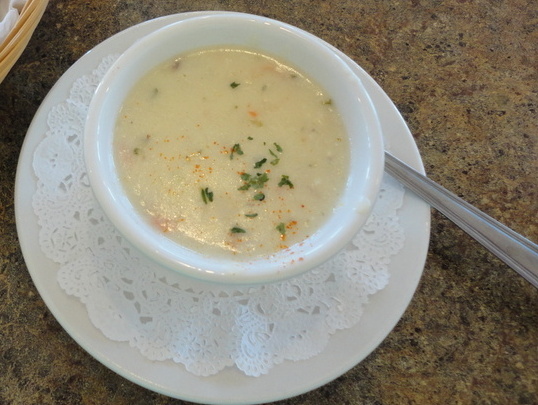 Our cream based chowder is made with local scallops and whitefish. We use succulent shrimp and, as often as possible, Atlantic salmon. Many of our customers have allergies to mussels and lobster and as such these have been omitted from our chowder. We hope you stop by the Sheltered Harbour Cafe again on your travels! 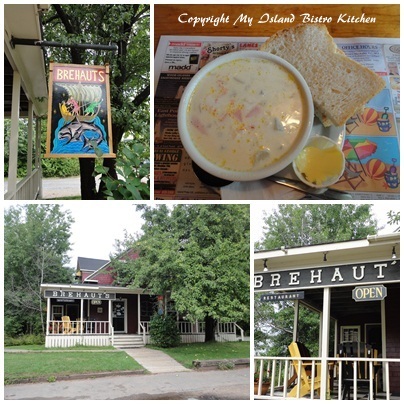 I must say, I agree that Sheltered Harbour Cafe makes great chowder. In fact, everything I have tried is just top notch. I have a summer cottage in P.E.I. and I used to bring all my friends to the Sheltered Harbour when it was at the gas station in Souis. Driving to Souis this summer I was upset to see it was not there and wondered what had happened. When I was dining at 21 Breakwater and saw Sheltered Harbour now had a beautiful restaurant, I was overjoyed. We came for lunch to Sheltered Harbour and I was really happy to see that it was still great food – and even better atmosphere. I’m sure we will make many more trips for lunch and dinner. Thank you for preparing such great food. We just returned from Souris, PEI and I have to agree that this chowder was the best of all we tasted throughout PEI this summer. I did ask for the recipe, but was told it was a closely guarded secret as Mary indicates. I will have to experiment myself, but look forward to returning to sample it again! Yes, Judith, the Sheltered Harbour seafood chowder is yummy! Last summer I attended one of Holland College’s Culinary Boot Camps and, as part of my story on the camp, they gave me kind permission to share, on my blog, one of the recipes we made during the day-long camp. It is also a very good seafood chowder and is the one I most frequently use. You can find the recipe by following this link: http://myislandbistrokitchen.com/2012/09/16/hup-one-two-three-four-its-off-to-culinary-boot-camp-at-the-culinary-institute-of-canada-2/ or by searching on my website for “Hup, One, Two, Three, Four — It’s Off to Culinary Boot Camp at the Culinary Institute of Canada” in the August 2012 archive.